CANTON, Michigan, (April 19, 2016) - The automation company Pilz is expanding its portfolio to include the diagnostic solution "Safety Device Diagnostics", which comprises a fieldbus module, junction and safe sensor technology PSEN. The new diagnostic solution enables a wide range of sensor data to be called up simply, including over distance. Service operations can be considerably reduced as a result, significantly increasing productivity. "Safety Device Diagnostics" provides data such as partial operation, voltage spikes and dips, temperature effects, switching cycles, bounce and RFID identification as diagnostic information. All the additional diagnostic data provided by each sensor makes preventive maintenance easier, which in turn keeps downtimes to a minimum. Simple remote maintenance via web server, for example, is not all. The integrated display on the fieldbus module also ensures that information is available not only on machine monitors but also directly in the control cabinet. The fieldbus module provides a single interface for the plant bus for all connected safety devices, helping to minimize installation work. Third-party devices can also be connected directly via the integrated I/Os. "Safety Device Diagnostics" is also easily expandable, supporting a modular machine structure. With "Safety Device Diagnostics", the same sensors can be used for the conventional wiring or for Safety Device Diagnostics. What's more, irrespective of the existing application the decision can be made as to whether Safety Device Diagnostics will be re-used for each individual application. The safety-related structure is always maintained because conventional signal contacts such as the coded safety switch PSENcode slimline design from Pilz are activated for this purpose by the Safety Device Diagnostics fieldbus module. "Safety Device Diagnostics" also enables fast, simple installation thanks to series field connection. 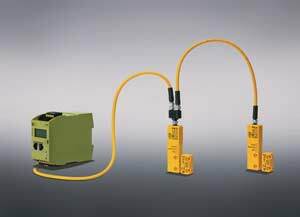 The combination of "Sensor Device Diagnostics" and safety relay PNOZ from Pilz, e.g. PNOZx or PNOZsigma, provides a complete, economical solution. With 2,000 staff worldwide, Pilz operates internationally as a technology leader in automation technology. In this area Pilz is consistently developing a role as a total solutions supplier for safety and automation technology. In addition to the head office in Germany, Pilz is represented by 32 subsidiaries and branches on all continents. Pilz also provides a comprehensive range of services with an extensive selection of training courses. With safety advice and engineering, a comprehensive and competent service is available. For more information, please visit www.pilz.us.